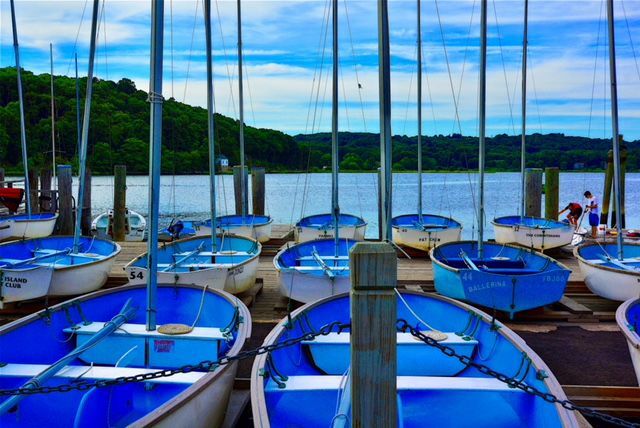 From Ray Mustafa: "Mystic Seaport sailing school, taken August 2012." From Sydney Maginnis of Charleston: "The photo was taken on Folly Beach, SC." From Allen H. McIntyre of James Island: "Photo taken over the marsh along the Ashley River." From Angela Carbonetti of Charleston: A jellyfish at the aquarium. From Angela Krumwiede, who took this photo of Isle of Palms in the morning. From Anne Possenti: "Near Baby Beach" on Aruba vacation. From Beth Kirchner: "Taken in Old Village, Mt. Pleasant, SC"
From Bill Lackner of Mount Pleasant: "My wife standing behind a tank of blue anchovies at the Aquarium by the Bay in San Francisco this summer." From Bob Morse of Charleston: "Sunset from Bowens island restaurant." From Natalie Chapman of Wadmalaw Island: "One typically thinks of a sunset as a very colorful end of the day with vibrant colors, but this one was truly a "blue" sunset over Wadmalaw Sound." From Brian Houghton of Mount Pleasant. From Cathryn Anne Holladay of Charleston: "I took this picture of a bicycle while walking through White Point Gardens." From Christie Corriveau: "May 2018 'vacation blues' taken on a flight from Eleuthera Bahamas to Fort Lauderdale." From Cindi Caron: "This was taken at Litchfield beach. The colors were particularly soothing that day. I live in Pawleys Island." From Gordon Dehler of North Charleston: "It was taken in late December 2017 during the full moon [daytime; around 11.30am] phase with a plane from Heathrow and the moon above Renzo Piano's magnificent shard in London. The photo was shot from behind the Switch House, which is the new connecting gallery structure opened in June 2016 on the back side of the Tate Modern [Bankside/Southwark area]." From Jackie Sunday: "Two years ago, we evacuated to Atlanta to escape Matthew. Here’s a photo of the Ferris wheel downtown in blue." From Jane Bailey of Reevesville, SC: "This photo was taken on Folly pier at Folly Beach. We took our grandchildren fishing! It was a beautiful day with blue skies and blue water!" From Jeff Marcus of Charleston: "Photo taken near Dockside looking out toward the Ravenel Bridge." From Jersie Messervy of Ridgeville, who took this photo at Falling Springs, Virginia. From Ken Schaub of Daniel Island: "Taken in Albuquerque, New Mexico during an annual balloon fest." From Kimber McFadden of Awendaw, SC: "This photo was taken off the end of my dock on the Wando River! Spectacular day it was!" From Merv Gibson of Charleston: "'Serenity Brook' Photo of mountain stream, Great Smokey Mountain National Park, near Gatlinburg, North Carolina." From Mike Fitzhenry of Summerville: "Dottie and I were picking up our grandson Stratton Noland from his 2 year old pre-school at Eastminster Presbyterian Church in Marietta, GA when we were struck by the contrast of the steeple and sky." From Mona Knight of Mount Pleasant, who took this photo in Santorini. From Nan Salas of Edisto Beach: "This is early morning Sat 9/8/18 on the back deck of Coots Restaurant . ... calm before the storm." Paul Brustowicz of Summerville: "New York Harbor from Ellis Island." From Robert Peterson of Summerville: "Nothing says BLUE like a bluebird! Taken at my backyard birdbath." From Ronald Allan Charles of Goose Creek: "Water doesn’t get much bluer than this scene at a surfing competition at Puerto Escondido Mexico’s Pacific coast, where a blue-clad surfer momentarily leaves the deep blue for the blue sky." From Roxanne Wells of Irmo, SC: "What is 'cooler' than the captivating Great Blue Heron?" From Scott Nelson: "This was taken on the beach on Kiawah Island." From Tom Dittrich of Daniel Island: "Photo taken downtown Charleston: St. Phillips Episcopal Church steeple."